It has been a strange strange month for the undead. Vampires havenât just been swarming entertainment news, but real world news as well. 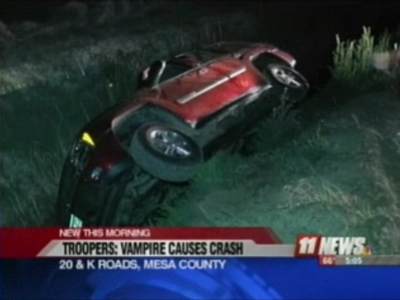 Yea, you read that title correctly, a woman in Grand Junction, Colorado claims that she spotted a vampires on the road ahead of her and it scared her so much that she threw her car into reverse and backed it into a canal around 11 pm. Authorities said that the woman was driving on a dirt road at K and 20 Roads near Fruita when she says she encountered the vampire. The woman was not injured. Her husband arrived on the scene and took her home. Troopers said that they do not suspect alcohol or drugs to be factors in this accident. They also added that they found no evidence of a vampire. I wonder why she thought it was a vampire? Hmmm. I know this isnât appropriate since a man is dead butâ¦ ahahahaha. Ahem. Anyway, A 23-year-old man watchingÂ Eclipse in Wellington, New Zealand was found dead after the show. He arrived at the theater to watch the 6 pm screening of the popular film. The man, whose name has not been released, was described as a visitor in the area. His body was found by the cleaning crew at 8:30 pm after the movie was over and they were preparing the theater for another showing. The theater was closed while the police were on the scene, but the show did go on in another part of the building while the police were investigating. There is still no word as to how the man died, but feel free to add your own jokes or theories. Like, Jacobâs hot abs were too much to handle, or that the movie was so bad the man couldnât go on livingâ¦ Iâll stop now. That’s kind of mean, Moonlight, to laugh at a dead man, lol…even if the movie did kill him because it was so bad. I bet he died because Robert and Kristen’s acting skills are so crappy. Jacob is innocent! B-otch u dont know wut ur talkin bout! robert and kristen wus great! so wus taylor and taylor isnt innocent cuz he can cause any accident with his nice abs!!! ohhhhh woooow ummm… i wanna believe that it wus a vampire that made the crazy lady go off the rode…. and bout the eclipse thing?… ohly god is that funny im cryin cuz i laughed soo hard! dang! yea uh the movie wus great i jus think the packs abs wus too much 2 handle… i wus hyper venilating myself…. Haha, vampires don’t exist. She is just mental, and loves jacob so much that she is imagining him everywhere. Vampires are stupid. Hi Moonlight, love your work and in particular I love the car crash story. A vampire causing a woman to run off the road is disturbing for several reasons, I mean who knows if people are actually seeing vampires or do they just ‘believe’ that they are seeing them? The popularity of vampires in recent years is overwhelming and it makes me wonder if people’s facts are being confused with fiction? I personally love anything to do with vampires although I can not confirm if I believe in them or not. I wish i could comment on your other story here about the man that died in the theater after watching ‘Eclipse’ (from the Twilight saga) but i fear that anything i could add would be too easy and far too cheesy!